1. Mix the prawns with the garlic, lemon slices, chopped chilli, 2 tbsp olive oil and seasoning together in a bowl. Cover and chill. 2. To make the salsa, mix the chopped onion, tomatoes and vinegar with seasoning, cover and chill. 3. When you’re ready to serve the prawns, peel, stone and chop the avocados and add them to the salsa with the basil. Check the seasoning. In a small bowl, add the the tomato purée and Tabasco to the mayonnaise and mix well. 4. Preheat a griddle pan. Thread the prawns in threes or fours onto wooden skewers and cook for 1-2 minutes on each side until pink and completely cooked through. 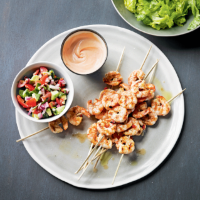 Arrange the prawn skewers on plates and serve with the salsa and mayonnaise in small bowls with the shredded lettuce on the side.